In forging the Concession Agreement with the MVP-Ayala group, President Aquino has betrayed the public interest and welfare and has put government in a patently disadvantageous position. While DOTC officials claim that the MVP-Ayala group submitted a negative bid of P9.5 billion – meaning they will pay government such amount to do the project – it is the commuters who will ultimately bear the burden as the concessionaire will recover the money from the riding public through higher fares as I explained in the previous post. Why is the Concession Agreement designed so favorably for the MVP-Ayala group? The idea behind PPP/privatization is to create the most conducive environment for private business. And to ensure that, the private investors will utilise all their connections and resources. The Ayala family, of course, has long been a political ally and crony of the Aquino family while there are claims that DOTC Undersecretary Rene Limcaoco, who was among those who pushed for LRT 1 privatization, is related to top Ayala executive Jose Teodoro Limcaoco. Anyway, with its permission, I am posting in full the position paper prepared by the Alliance against LRT Privatization which discussed the different issues related to the takeover by the MVP-Ayala group, including the onerous terms of the Concession Agreement and the displacement of hundreds of LRT 1 employees. 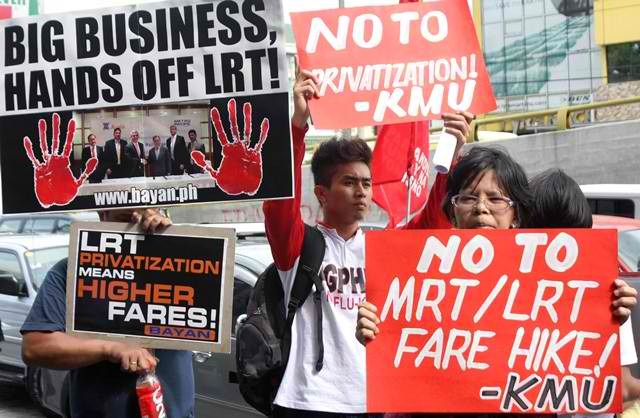 The Alliance Against LRT Privatization (AALP) opposes the privatization of the LRT1 Operations and Maintenance and the Public Private Partnership program for the construction the LRT1 Cavite Extension. The project is grossly disadvantageous to the riding public, the government and the employees of LRTA. The government’s privatization program dubbed Public Private Partnership has been touted as the solution to the lack of services and infrastructure plaguing the government. Under this scheme, private investors will supposedly bring in investments that will benefit the people, thus easing the financial burden on government. In the early phase of the PPP Program, the Aquino government has vowed not to employ “sweeteners,” purportedly to avoid pitfalls besieging PPP predecessors such as, among others, the Build-Operate-Transfer (BOT) Scheme employed in the privatization of the National Power Corporation (NPC), and the Build-Lease-Transfer (BLT) Scheme of the MRT3, that consequently increased government’s debt burden due to sovereign guarantees given to entice private sector participation (PSP). However, the privatization of the Operations and Maintenance of the entire LRT1 has served as a sweetener to the LRT1 Cavite Extension Project. While the winning bidder is in the process of constructing the extension from Baclaran Station to Niyog, Bacoor, Cavite, the national government has offered the private concessionaire the operations and maintenance of the entire LRT1 system, from Roosevelt Station to the Baclaran Station. Currently, the profitability of the entire LRT1 system has been maintained after the national government took over the operation and maintenance of the entire system from the private sector, specifically, Metro, Inc. a subsidiary of the Meralco Corp. in 1999. Based on its 2013 financial statements, the LRTA has earned a gross revenue of PhP 2.5 Billion from its LRT1 operations. Prudent spending and high public patronage has enabled the LRTA to achieve a 1.26 farebox ratio, one of the highest in the international rail community. Farebox ratio is the fraction of operational expenses, which are met by the fare paid by the passengers. It is computed by dividing the gross revenue by the total operating expenses. LRT1’s high farebox ratio signifies that rail revenues generated, excluding non-rail income (from advertising, lease, etc. ), were more than enough to cover the operating expenses for the year with extra funds for other expenditures (e.g. subsidy for LRT2 operations). In the present set-up, where the LRTA operates and maintains LRT1, the working capital is not subsidized by the government. The privatization of the operations of an entirely profitable system will ensure another source of profit to the winning bidder in the Line Extension. We should question whether the profits earned from the operations of LRT 1 would be the source of the investments for the Line 1 Extension. To attract investors, government assumed even more financial risks while passing on increased financial burdens on the consumers. Government assumes payment of Real Property Taxes. On November 21, 2013, the NEDA revised the terms of the Cavite Extension Project to conform to the demands of the bidders, including the payment of Real Property Taxes (RPT) to be shouldered by the national government. This means government will pay around PhP 64 Billion for the entire 32-year contract period. This will only result to more debt burdens for the government. Fares will increase as a result of privatization. The government agreed to a 5% fare increase upon project completion, The government is also keen on implementing the new distanced-based fare adjustment that has been stalled since 2011 due to public opposition. At the earliest, the DOTC hopes to increase fares by August 2014 prior to the target effectivity of the Concession Agreement on September 2014. This will ensure higher profitability for the Concessionaire, as well as higher base fare for any future fare adjustments it will require upon project completion. Private concessionaries will pass on VAT to commuters. If a Sales Tax or Value Added Tax (VAT) is levied on the fares, the government allows the Concessionaire to pass this cost as part of the fare collected from the passengers of LRT1 (Schedule 9, Part 1E: Financial Matters, page 177, Schedules, CA). With all these assurances from government, privatization removes from the private Concessionaire any financial liability and business risk, transferring instead all risks and liabilities to the government and the commuters. The hybrid PPP mode itself is very lopsided and biased against the government. It is essentially called a hybrid PPP variant because if a project is more than PhP 60 Billion, half the cost is supposedly shouldered by the government through Official Development Assitance (ODA). But under the LRT1 Cavite Extension Project, it is the government that will be shouldering the lion’s share of the cost of the project. Of the PhP 64.9 Billion total project cost, the private sector will shoulder PhP 30B for the civil works, electro-mechanical systems and other components of the viaduct, trackworks, stations and facilities, and the operations and maintenance. On the other hand, government will shoulder PhP 34.9 Billion of the cost for Right of Way Acquisition, Purchase of Coaches, Civil Works for the upgrading of the existing Depot and construction of the Satellite Depot. On top of these expenditures, government will also shoulder the roughly PhP 64 Billion payment for Real Property Taxes. In the privatization of the LRT1 Operations and Maintenance, around 964 Contractual Employees of the LRTA are to be hired by the Concessionaire subject to a probationary period of 6 months, in which the Labor Code provisions, no longer the Civil Service provisions, shall govern. Some of these Transferring Employees have been with the LRTA for almost 15 years when the LRTA took over from the Metro, Inc. and would have been eligible for old age pension under the GSIS Law by 2015 or after 15 years of government service. Within 3 months, the Concessionaire shall conduct an assessment of the transferred employees and determine who shall continue to be employed by the Concessionaire after the lapse of the 6 months period. After the lapse of the 6 months period, “if the Concessionaire wishes to dismiss any employee due to Economic Causes (e.g. installation of labor-saving devices and/or redundancy), then the Concessionaire may do so in accordance with relevant rules and procedures (Section 6.3, page 58, CA). The privatization of the Automated Fare Collection System this year has clearly provided the LRT1 Concessionaire with the “economic cause” to terminate employees after the lapse of the probationary period. Conservatively, only around 241 or a fourth of the transferred employees will remain with the Concessionaire, possibly to be sub-contracted. Hence, contrary to the government spin that the PPP program will create more job opportunities, it will in effect displace workers, after the 6 months probationary period. From the current provisions of the Concession Agreement and the TOR for the PPP Project, it seems that the government has once again refused to learn from its past failures in privatization. The previous BLT and BOT schemes indeed delivered the required infrastructures for the public but with horrific consequences for the government and the people in general. The Privatization of the MWSS has resulted to periodic increases in the cost of water, now totaling nearly 400%. The privatization of the assets of the National Power Corporation has placed power generation in the hands of big business and has increased power rates by a 100% from the time EPIRA was enacted. Closer to the LRT1 scenario is the MRT3 experience, which invariably had the most lopsided risk allocation profile against the government. At first the government promised no state subsidy, but with 8 revisions to the Concession Agreement, government assumed the financing for the Right of Way Acquisition, and up to now has been assuming the traffic risks, and extended loan guarantees. Government allocates some P7 billion a year to pay for the financial obligations of the MRT arising from the lopsided contract. The government is now trying to buy back MRT3 from the MRTC. What the government seems to forget is the basic dynamics between the government and the public sector for past PPP or BOT project implementations. The PPP or BOT projects revolve around financial viability for the private sector and economic viability for the public sector. Both sectors have varying objectives: for the government, it is to implement the project, while for the private sector, the objective is to maximize the Return of Investment (ROI), which can only occur by increasing the cost of the project assumed by the public sector or increasing support from the government either in terms of tax breaks, credit enhancements, subsidies, and the like, or reducing risks. To expose vital government infrastructures to the desire of the private sector to maximize profits is to expose the government to more risks, instead of benefits. The past has proven that the benefits have far outweighed the benefits derived. What is also frightening is the power wielded by the winning bidder. The Ayala-Metro Pacific (MVP) consortium would eventually control Line 1 operations, the Automated Fare Collection System, and the construction of the Line 1 extension. Metro Pacific also controls part of the MRT 3. This is a virtual monopoly in the train line which will remove any possible checks and balances regarding its performance and give them tremendous control to dictate fares. We, the Alliance Against LRT Privatization, a network of concerned individuals, employees and commuters, call on the people to reject the privatization of the LRT Line 1 Operations and Maintenance and the hybrid PPP mode of implementation of the LRT1 Cavite Extension Project. We call on Congress to conduct an inquiry on the present state of the LRT Line Systems, amend the Procurement Law to fast track the procurement of vital capital spare parts and arrest the downgrading of the LRT systems and facilities, and to increase the capitalization of the LRTA from the current PhP3 Billion to PhP300 Billion. In layman’s terms, the 1.26 farebox ratio means that for every 1 Peso spent in operations and maintenance, may 26 cents profit? Is that correct? Ang mas accurate ay for every P1 in actual O&M cost, commuters pay an extra 26 centavos. Farebox ratio does not measure profitability but actual fares in relation to O&M expenses. thanks for the clarification sir and for your work as well.